Taste test: These are regular potato chips (non-rippled, non-kettle, etc.) 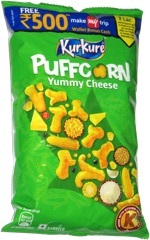 that have cheddar and sour cream on them, the cheddar taste is more prevalent than the sour cream. Not bad, we liked these chips. 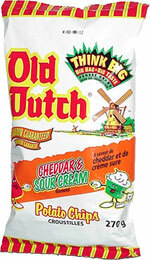 If you're in Winnipeg and you have a craving for cheddar & sour cream chips, you can't go wrong with these. Smell test: Standard potato chip aroma — nothing that knocks us out.